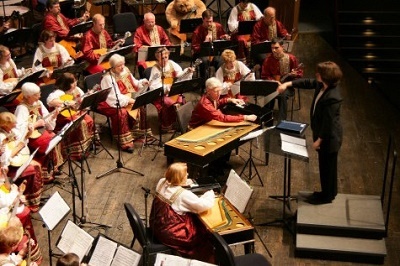 The Washington Balalaika Society orchestra of 60 musicians will present its fall concert with a musical repertoire replicating a typical Russian winter! One of the musical selections, ‘Russian Winter,’ is a medley of folk songs about the troika, a traditional Russian sleigh pulled by three horses. ‘Woolen Boots,’ featuring WBS Concertmaster Andrei Saveliev portrays ‘Valenki’ the traditional winter Russian footwear made from thick felted wool. Featured soloists, vocalist Irina Zagornova and baritone Isaiah Trofimenko will each perform songs showing how snowstorms are no obstacle to love! Peter Omelchneko, domra virtuoso, is also a soloist.